Summer can be such a busy time for the SY&Co. crew and often times our weddings are getting bigger and bigger, with the designs becoming more grand and intricate. Minnie and Carl's wedding at Camarillo Ranch was a breath of fresh air, reminding us to step back and appreciate what is most important- love. Their wedding took advantage of the gorgeous venue, allowing all of the rustic wood and tall trees to speak for themselves. Thank you to Vivian Lin for capturing these beautiful images! For the ceremony, a special emphasis was placed on the handwritten scroll that stood over 14ft tall and met at the couple's feet (Shoutout to the amazingly talented David Chang and his custom masterpiece). The calligraphy was lined with lush greenery carefully tied together into garland that ran well over 20ft long. Then, cascading down from the top of the large barn doors, we hung strands of led lights which ultimately met dozens of ivory pillar candles in various heights and widths. This design oozed romance and intimacy and paired with beautiful rustic tuscan chairs took our breath away. Shawna and Jeany have wanted to do this look for a long time now and were ecstatic for the opportunity. Minnie's crescent shaped bouquet beautifully complemented the overall design for the wedding. Greenery cascaded down the sides and at the center we gathered beautiful white florals and more delicate greens. The design was a delicate balance between the rustic beauty of the outdoors and modern elegance. Because of this, we carefully played with elements from both designs. Dancing along the tabletop were beautiful glass geometric shapes paired with rustic antlers, petite glass vases paired with warm pillar candles. Our long centerpieces sat atop eight foot long farm tables with beautiful ivory and white wisteria cascading down to eye level. 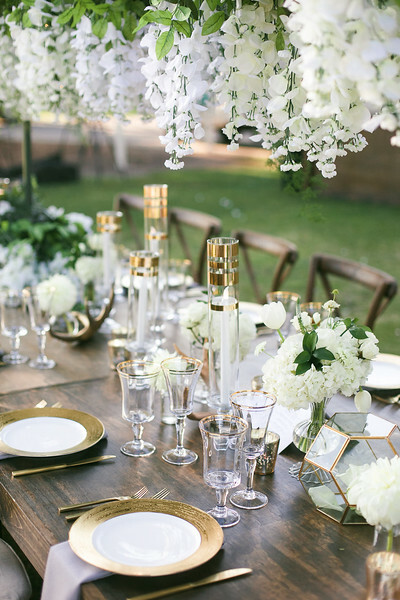 At the tabletop we placed dozens of clear glass sleeves with a modern gold trim, petite florals, and rustic elements. And we can't go without mentioning these massive round centerpieces. Standing at over 5 feet tall, our custom gold frame structures (known as invisi-boxes around our studio), dominated the tabletops. Overgrown and wild arrangements of greenery were carefully nestled on top while more petite florals, rustic elements, and custom gold-accented tapers mingled at the base. Congratulations to Minnie and Carl from the SY & Co. team! Lead Designer: Jeany at SY&Co.